One Momma Saving Money: Mother's Day Craft! 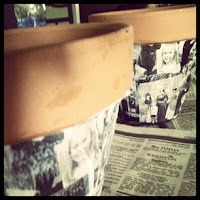 - A Modge Podged photo flower pot! Mother's Day Craft! - A Modge Podged photo flower pot! Here is a fun and super easy craft for the kids to make for Mother's Day! A Modge Podged photo flower pot! Once done, add a plant and you are all set! 10-20 photos (depending on the size of pot) printed in black and white on paper. I just took some pictures into Microsoft word and re-sized them all onto about 3 pages and then cut them out. 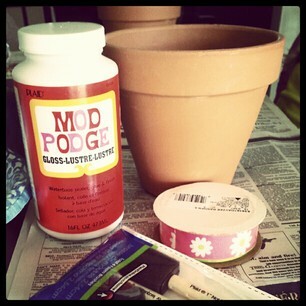 If you don't want to purchase Modge Podge, you can make your own using Elmer's glue. I am not sure how it would work compared to the Modge Podge, but a cheaper alternative. To get started, lay out old newspapers on your work surface so you don't get the glue everywhere! I also poured the Modge Podge into paper plates/bowls to make it easier for the kids to use! Take a foam brush and brush the Modge Podge on the section of the pot you are working on, then place on photos. Feel free to layer, over-lap, etc. Apply more Modge Podge as needed on areas that are drying out or needed. Once all the photos are on the pot, apply a couple more coats of Modge Podge to seal it! Cut ribbon so it is long enough to wrap around rim of pot. Brush the Modge Podge on the rim, lightly push ribbon on the Modge Podge and then tie it!